There might not be a Springfield in every US state, but it sure seems that way. There are 36 Springfield townships in the US across 25 states, including 11 in Ohio alone. Whether you’ve run out of road-trip ideas, or you’re just the biggest Simpsons fan on the planet, a Springfield tour of the US could be the perfect framework for your next cross-country road trip. 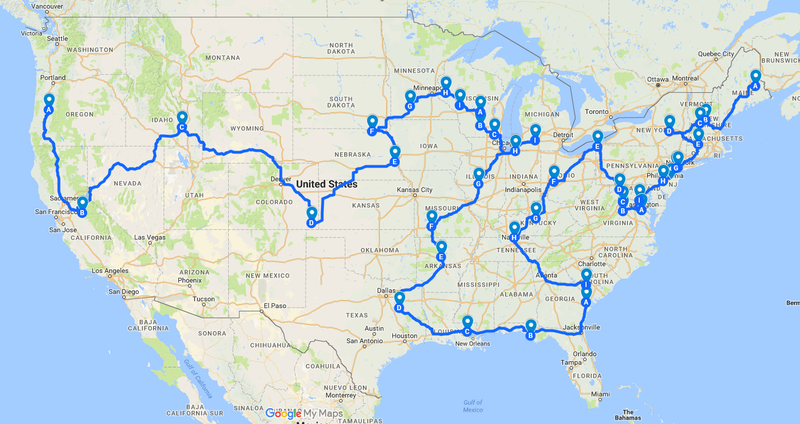 This map, posted by Redditor GreenMobius, shows the most efficient route between every Springfield in the United States. The route takes you from coast to coast, touching all the major regions of the country except the Southwest. You can make your way through California, across the mountains of the Midwest, down to the coast of the Gulf of Mexico — of course passing through New Orleans along the way — and up through the deep South to New England. Visiting each Springfield will give you a pretty complete cultural tour of the country. While the nation’s 36 Springfields might share the same name, you can bet that they’re incredibly diverse when it comes to their people, food, aesthetic, and local culture. So buckle up for a pretty unique road trip. You might not see the Kwik-E-Mart, nuclear power plant, or Mr. Burns’ mansion, but you’re sure to catch a lot of other cool, unexpected sights.